This weekend, instead of trying to catch up on two weeks worth of NaNoWriMo, I decided to focus my efforts on an even older project that was near completion. 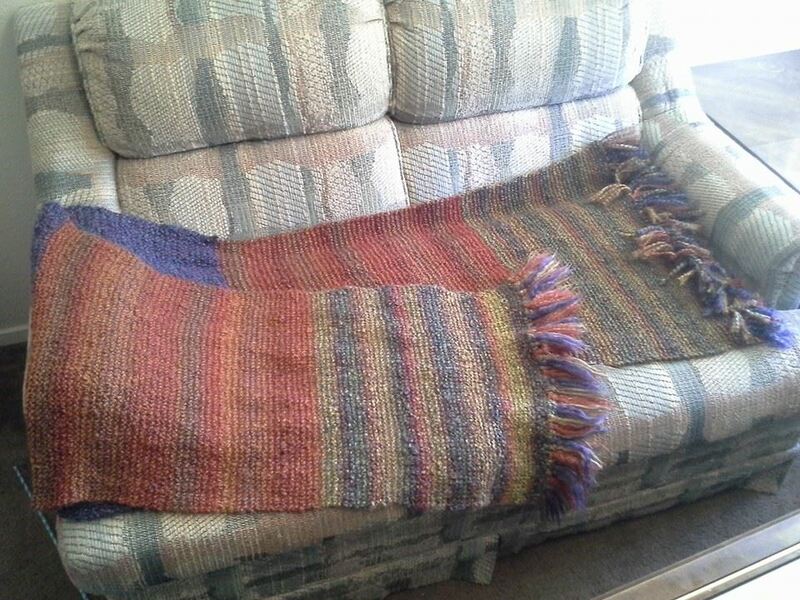 I’ve been working on this jumbo scarf/wrap thing since sometime in August…last year. I got about half of it done before NaNo, then I put it down to start writing. Then the cold weather hit and it was too cold to knit. We had some awkward weather at the beginning of the year, so it would be warm for a week and I’d think “Okay, there’s no point finishing it until the next cold season, because it’s going to be warm now.” The next week, I’d kick myself for not working on it. By the time our last unusually cold week ended, it was well into spring. I decided I had the rest of the year to work on it, so naturally I didn’t pick it back up until this month. I needed to be finished with it. I started the last skein on Friday, and Saturday morning when I realized there was hope that I could finish that day, I camped out on the couch with a big mug of chai and listened to the heavy rain at the window while knitting. Just after midnight on Sunday, the project was complete. Every muscle in my body ached and I was exhausted, but that’s one thing I can finally check off my list. Since I started growing my nails out, working with my hands has been awkward. Typing, knitting, painting, drawing, cooking, all the things I should be working on have been a special challenge. This weekend I finally got comfortable with my new hands. When we got to work, I retrieved the tip from the floorboard to take a farewell picture. 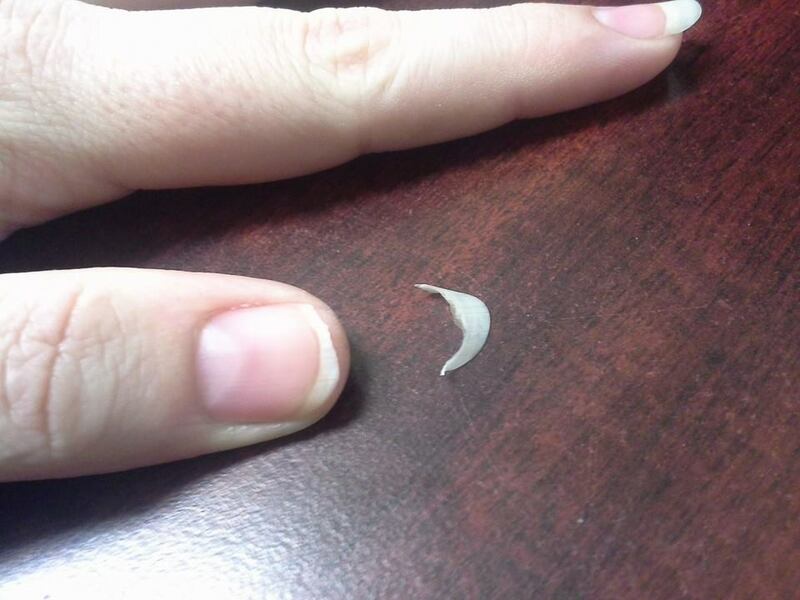 That nail has been through more hell than any other, but something strange has happened. It’s been almost 3 months now since I started growing out my nails, and as uncomfortable as they were at first, I’d finally gotten used to them. Now my thumb feels strange and useless. I find myself trying to use the nail and being disappointed at the soft, blunt end of my finger. My thumb looks strange and foreign on my hand now. It’s amazing that I could spend 32 years of my life with nails cut back to the quick, and after less than 3 months it feels so weird to go back to that.